Motorcyclists love spending time on their cycles. As a sword is the extension of the warrior’s spirit, the motorcycle is a vehicle the adventurer uses to attain their dreams of freedom. Because of the ability to find long stretches of open road and sky, motorcycles and camping seem to go hand-in-hand. 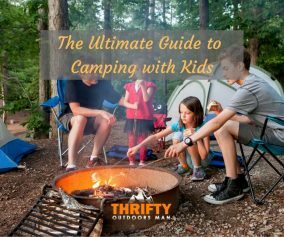 So why not bring a tent and some goods along for the ride, just in case you find the perfect place to start a camp, light a fire, and an enjoy a quiet evening all to yourself? When it comes to motorcycle camping the first time, the task may seem a bit daunting, if not entirely overwhelming. You only have a motorcycle, after all, so you can’t overindulge in equipment like you could heading to a campsite with a pick-up truck or RV. Luckily, you are not alone in your decision-making! 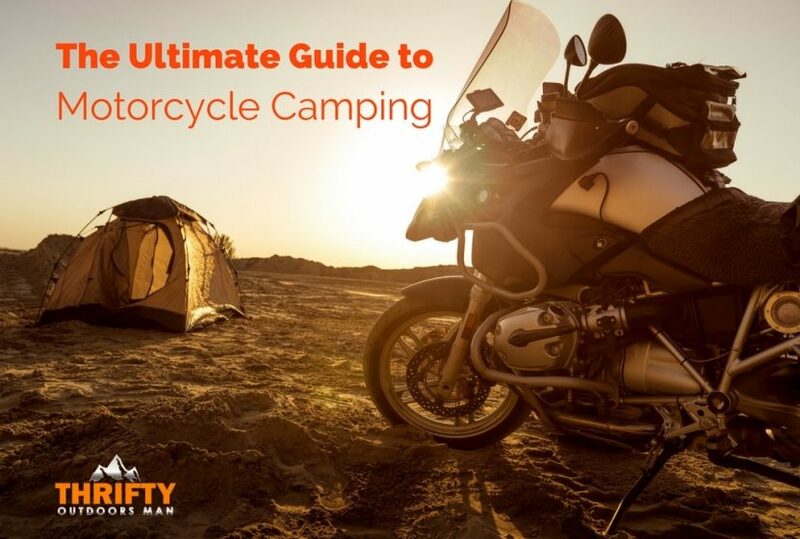 This guide aims to give you solid advice on all the parts of motorcycle camping, from selecting the gear you’re going to need to making the trip go off without a hitch. First, you might be thinking that towing a mini-camper behind you motorcycle is a bit crazy. However, with the right equipment, you will barely notice the trailer. The overall feel of the motorcycle’s ride will go unchanged, and you won’t have to worry much about guzzling gasoline if you choose a trailer that is sized perfectly for your needs. The only thing you need to be aware of is that the trailer will add extra width behind the bike, making weaving in and out of traffic a bit dangerous. You will also need to anticipate a difference in turning. Once you get used to this difference, though, hauling a motorcycle trailer to a camping spot is very convenient, because you no longer have to worry about cramming everything into your luggage bags. Think about the motorcycle hitch you are going to need. Purchasing an isolating trailer wiring kit is going to give you a lot of customization potential. Plug-and-play versions can be bought for most Harley-Davidson and Goldwing models. You can also consider “swivel adaptors” also called “swivel hitches” that allows the coupler on the trailer to rotate, adding extra degrees of safety to the trailer you are towing. Motorcycle cargo trailers are not one-size-fits-all. As unfortunate as it may be, some motorcycle trailers are compatible with only a certain make. For that reason, you need to first consider the make of the motorcycle you are buying for and see if a nearby dealership has trailers that suit your needs. Secondly, depending on the size of your bike and the amount of power it has, the weight that it can successfully tow changes. Trailers usually range from 150 pounds to 400 pounds (not including the gear that you will be filling the trailer with). However, a pull-behind trailer is not mandatory. If you are a minimalist, you may be able to get away with packing all your goods into the saddle bags and luggage. Obviously, one way you are going to bring along the items that are going to provide you comfort during your trip is by using motorcycle luggage. There are several styles and fabrics you can choose from. What it comes down to, though, is finding the spot between comfort and how much you wish to spend. If getting from Point A to B is your sole concern, then you certainly don’t need the most expensive piece of luggage on the market! This includes aluminum and composite panniers. These hard cases are perfect for the rider who goes the distance. Hard luggage provides major advantages for long trips, including water resistance, quick access, increased security, and large capacity. There are some wonderful hard luggage sets, like the SW-MOTECH TraX 45L ALU-BOX or the GIVI Trekker Monokey Top Cas﻿﻿e that is compatible with a number of motorcycles. You simply have to buy the rack that suits the make of your bike. Some pannier systems even have quick-lock mounting racks that make removing the case and carrying them with you incredibly easy. Hard luggage also have the highest durability. Where you can expect a textile bag to wear out around the 20,000 mile mark, a hard case will merely have some scratches. Since the hard case is going to be much more resilient to damage, it is best for fragile technologies, like your camera or computer, particularly during the potential fall. Some disadvantages of hard luggage include the weight and shape. If you plan on sticking to pavement or packed dirt, hard luggage is fine. It is when you decide to try to navigate trails or go off-roading that the hard luggage can become an unwieldy addition to your ride. Three empty hard cases alone will add a good 40-60 pounds to the bike. Imagine those boxes fill to the brim with goods. Meanwhile, soft luggage will only add around 10 pounds. This is actually referring to sewn textile bags, not soft “dry” bags. There is a clear distinction between the two that will be discussed a little further on. Soft textile luggage is light, compact, and doesn’t add bulk or weight to the bike. Those with speed bikes tend to prefer this style, as they can weave through traffic without having to worry about becoming unbalancing. Textile bags also have an advantage over dry luggage—they are very easy to access, thanks to zipper entry. Another feature unique to soft luggage is the availability of outer organizer pockets or multiple compartments. You are going to want soft textile luggage when riding in areas without a high presence of dust and heavy, unpredictable downpours. Since sewn fabrics are never truly water or dust-proof, there’s a chance your items could be damaged. Soft saddlebags do take time to attach and remove from the cycle. On the flip side, soft luggage doesn’t require special mounting, and so you can switch it from bike to bike. The Dowco Rally Pack that is reflective, water resistant, and holds up to 35L. Do note that some textile soft luggage options are the traditional “throw-over” type (usually seen as the leather compartments on Harley-Davidsons) rather than a quick-release mounting system. Both are secure, but a mounted side case is preferable to a throw-over for security. You never know what is going to happen on the open road, yet rain or shine, you ride. Wet conditions bring mud, meaning a typical sewn bag is not going to hold up well. This is where you need a waterproof and mud proof bag. Dry luggage is wonderful for the trip that will have you crossing water, spending time in inclement weather, and going out for long periods of time. The difference between dry luggage and soft luggage is that dry bags are designed with roll-tops and buckles inside of stitching and zippers. This means that nothing can get inside because there are no interstices. Dry bags are often made of a heavy duty, welded waterproof polyvinyl chloride (PVC) or thermoplastic polyurethane (TPU). Not only are PVC and TPU far more durable than textiles, they are very easy to wipe clean. However, where a canvas saddlebag is quick to get into because of zippers, a dry bag will take a bit more time to unroll. Still the tradeoff for keeping your belongs dry and free of dust and mud is a plus by itself. The Wolfman Expedition Dry Duffel Bag Medium --this is a 100% waterproof bag that was welded by radio frequency, so there is absolutely no stitching, has a 22oz vinyl body and 34oz vinyl sides, roll-top design, and has 4 compression straps. It will easily attach to any rack you have on your motorcycle. You may not like the yellow, but there is also black bags available. The capacity of the Wolfman Expedition Duffel Medium is 33L, and it weighs around 3.4 pounds when empty. 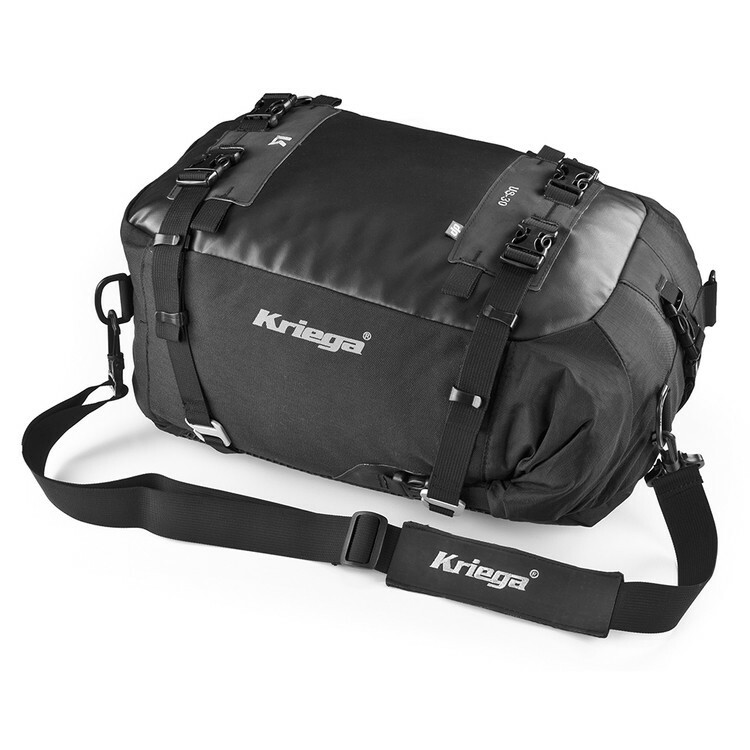 The Kriega US-30L is a unique trail pack system that is a universal design for all motorcycles and bikes. You can choose from 5-30L capacity and create a modular luggage system that is perfect for your bike. The dry bags have quick-release hooks and subframe loops (supplied by the maker). You can enjoy the added convenience of the removable shoulder strap from carrying the drypack from the bike to your campsite or anywhere else you end up going. Though the main compartment is 100% waterproof, there is a zippered side pocket. Or the Loboo Waterproof Dry Duffel Bag for Motorcycling -- With this duffel bag by Loboo, you will never again have to worry about capacity issues, because it’s a whopping 66L. Included with the bag are two dismantling belts that allow for quick installation and can withstand a weight of 200kg. The bag is also completely waterproof, has a roll-top design, and is also snow proof, hail proof, and withstands high and low temperatures well. Wiping the bag clean is a cinch, too. Once you reach your location, you can easily remove the duffel from the back of the bike and carry it with the removable shoulder strap. Again, whatever luggage system you choose is going to be dependent on two things: the kind of camping you do and how much you can afford. Now that you know about pull-behind motorcycle trailers and the luggage system for getting your camping necessities to the site, it is time to look at all the stuff you should be bringing along for the journey! Heading out on the road with your motorcycle and trailer or saddlebags brimming with equipment adds to the excitement, but how do you decide what to bring and leave at home? It’s sometimes surprising how much motorcycle camping equipment you need to bring along for a camping trip. Ground Cloth -- this can be a simple piece of waterproof plastic, like a PVC-coated tarp. A ground cloth will add insulation to the bottom of your tent or sleeping bag while protecting you from both the cold and moisture. Also, it will protect a tent’s bottom from the abrasive ground, extending its usefulness. Motorcycle Safety Apparel – Helmet and other appropriate clothing. Though not every place you go has a law requiring you to wear a h﻿﻿elmet, remember that your safety is constantly at risk while driving a motorcycle. A note on non-perishable food: some riders choose to forego the meal preparation and simply find ways points during their journey to purchase quick meals. This, however, is not the most budget-friendly method, especially if you plan on camping out in the wilderness for a set number of days. Aside from these ten items listed, there are other items to consider. You can read more about these items below. Though many moto-campers will fabricate a makeshift tent by draping a tarp over their campsite by anchoring one end to the bike and the other to a picnic table or a tree, or using a bivy bag (also known as a bivouac sack), you cannot deny the security and privacy a good tent brings to the campsite. 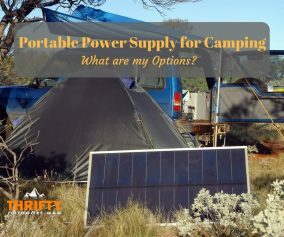 Tents come in a range of shapes and sizes, and you may be opting to go for the best and biggest out there--but there are a couple of elements you need to keep in mind: you want a light tent that is easy to set-up. An example of this is a self-supported tent. Also choose a tent made out of ripstop nylon, because this material is heard to tear, and even if it does rip, you can easily fix the tear. Lastly, if you want to secure the tent in place, only purchase metal stakes (and be sure to bring a hammer for driving them into the ground). Think about getting a tent with a rain fly or buying one. A rain fly will keep both water and UV rays out of the tent. Nothing is worse than having the bottom of the tent turning into a bathtub while you sleep. 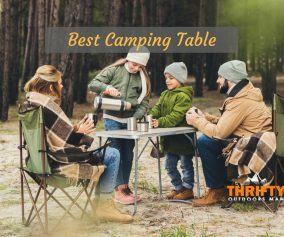 There are three main types of tents you should consider for your motorcycle camping trips: family tents, expedition tents, and backpacker tents. When choosing which size is correct for you, remember that the tent needs to be able to protect your goods and you overnight but will also fit on the bike when packed. 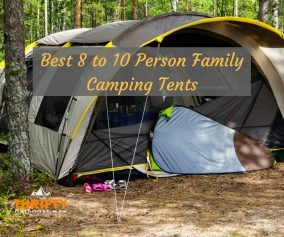 Family tents are the typical dome tent, holding anywhere from two to six adults. These tents can be bought at also sports and outdoor store. Since these are often designed for car campers, however, weight and pack size could be an obstacle. Larger luxury motorcycles should be able to handle the extra 20-50 pounds, but a Honda Rebel 250, on the other hand, will have issues. Expedition tents are uniquely designed for moto-adventurers. 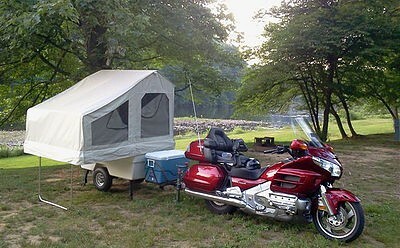 If you dream of riding your motorcycle cross-country, this is the tent for you. There are two sections: one for you and a partner, and the other side is for your motorcycle. The pack size is small enough to not be an issue for any bike but is still comfortably large when constructed. Lastly, there are backpacker tents. These are the barebones of the camping world. Lightweight, extremely small when packed, and also fairly cramped when constructed. The sole advantage is having the ability to carry the tent with you wherever you go. The Eureka Apex Solo Tent -- this is a single sleeper tent with a factory sealed main fly and floor seams. It is quite huge (14.8sq ft), so you don’t have to worry about not being able to get comfortable. There is even a front vestibule that allows you to store extra gear. UV resistance and water resistance is high. Plenty of ventilation. The tent is even made of flame retardant material. Additionally, stakes are included, adding to the overall security. An excellent buy for a decent price. The Harley-Davidson Rider’s 4-Person Motorcycle Dome Tent -- First, a word of caution with this tent: there is no way you are going to get 4 people inside. It is not that big, so don’t be fooled by the name. However, when you use it for 1 or 2 people, the tent is quite spacious. This is an example of a expedition tent, because it has a vestibule for you park your Harley and keep it safe from the elements. 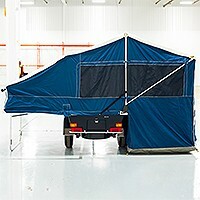 The tent has front and rear doors, meshing to provide UV and water protection and zipper storm flaps. The frame is made of shock-corded fiberglass. Also keep in mind that the tent poles are not short enough to fit inside a regular stock-sized saddlebag. You are going to have to bungee them to the top of a bag. Though your motorcycle is the ultimate partner for a camping trip, the actual destination is only as good as the equipment that you bring along. Don’t underestimate the need for a decent night’s rest on a comfortable sleeping mat or sleeping bag. Manufacturers generally rate their sleeping bags based on the pounds on insulation, but this rarely gives you a good idea of how restful the night will be. Some things to consider is the materials used as insulation. Goose down is a natural insulator that is better than synthetic materials, but it’s also more expensive and can retain moisture. On the other hand, synthetics are ideal for whatever conditions you are enduring during your trip and are easy to pack. Shape is based on your taste alone. Mummy bags are great for fall and winter, when you want to be warm. Unfortunately, they are also restrictive. Restless sleepers who change position may benefit from a rectangular sleeper or a pad. Sea to Summit Comfort Light Mat -- A synthetic mat made with Delta Core Technology that provides consistent warmth even during temperature changes. Super light (weighing around 1.5 pounds) and not very thick, making it very easy to pack. Therm-A-Rest Trail Scout Self-Inflating Sleeping Pad -- Hands down one of the best sleeping pads for motorcyclists. Light and compact, Therm-A-Rest also delivers an excellent night’s rest. The expanding foam core will self-inflate once unrolled. All you need to do is top it off with a very breaths to maximize the comfort level. The Trail Scout model comes in various lengths and offers the most warmth and support when compared to other similar models. Both side and back sleepers will be delighted by the Therm-A-Rest. TETON Sports TrailHead +20°F Sleeping Bag -- Plan on going someplace where the temperature drops rapidly overnight, like the desert or a mountainside? Then the TETON Sports Trailhead Sleeping Bag with a survival rating of +20 degrees Fahrenheit is going to work exceptionally well. The foot box design gives your feet enough room, even when sleeping on your back. The full-length zipper blocks chilly drafts, and the diamond ripstop shell is both water and tear resistant. Also comes with a lifetime warranty. Comfort Pak + Fleece Liner -- This mummy-shaped sleeping bag comes with a washable fleece liner. Stay cozy all night long with the DuraLoft Micron Insulation, insulated zipper to block drafts, and the chest guard. You can also combine two bags to create a king-sized bed (if you are traveling with a companion or two). You can also remove the fleece liner if you are using this sleeping bag during warmer months. It is one of the heavier bags, topping at around 4 pounds. Shoes and Sandals – if you’re camping someplace that has shower facilities, always bring flip-flops or water shoes to use in the shared shower space. It’s more hygienic that way. You may find that you need very little clothing for your camping journey, especially if the trip is only for a couple of days. Remember that your storage capacity may suffer if you pack more clothes than necessary. Be selective about what you want to bring, prioritizing the safety items and essential utilities over clothing. Etekcity Portable Backpacking Stove -- Comprised of durable aluminum alloy and stainless steel but also ultralight and collapsible for superb portability. The stove is compatible with any 7/16 thread butane or butane-propane mixed canister. You can even control the flame! The best part? The Etekcity Backpacking Stove adheres to the “Leave No Trace” principles of the US Forest Service--i.e. No footprint. BioLite Campstove Bundle -- There are single versions available, but if you would rather get all your camping cooking devices out of the way, the bundle is the most affordable and efficient purchase you can make. The BioLite is actually award-winning for the portable grill and kettlepot. The bundle comes with a USB flexlight too. You can easily transition from a campstove to a wood-fire grill in seconds. The kettle is great for making up fresh cup of coffee in the morning. GSI Outdoors Pinnacle Soloist Cookset -- Ultralight, crushproof, and heat-resistant...all adjectives that you want for your cookset. The Pinnacle Soloist cookset is unique in that everything you need is right there in a stackable set, maximizing efficiency while reducing the overall weight and space taken up in your luggage. The unique bowl/mug is stable, so it won’t spill and also keeps liquids and food hot. You even get a spork. GSI Outdoors Bugaboo Camper Outdoor Cook Set -- Similar to the Pinnacle Soloist cookset but ideal for serving a larger number of people. The cookware is coated with Teflon and is also crush-proof. All the items are color-coded to personalize tableware settings. In total you get 1 fry pan, 2 pots, 2 strainer lids, 4 mugs with sipping lids and insulating sleeves, 4 bowls (as part of the mug), and 1 pot hold. Mountain House Freeze Dried Pouches -- Just add water! The dehydrated food packets are lightweight and provide balanced nutrition. You can buy bulk cases, too, which is cost-effective. Eating utensils -- Since only the Pinnacle Soloist Cookset provides utensils, be sure to pack a set! You can either choose between eco-friendly bamboo spoons, forks, and knives, or simply bring a stainless steel set for easy washing and cooking. Dinnerware -- An example is the 8-piece BPA-free meal kit by LIght My Fire. You can a plate, bowl, cup, cutting board, spork, and harness so you can attach it to a backpack or store the entire kit away easily. The entire set is also dishwasher and microwave safe, so you can get more use out of it than just moto-camping adventures. Cruztools SpeedKIT -- Sometimes you need to make quick repairs to your bike or fix something that’s broken among your gear. The Cruztools SpeedKIT Compact Tool Kit is a perfect addition to your road tool box. The tools provided fit into most OEM tool cavities. You get wrenches, hex keys, a 5/8 x 18mm spark plug socket, pliers, tire gauge, and more, all tucked into a sturdy zippered pouch. The entire pouch, tools and all, only weighs 1.4pounds. Just make sure you get the kit that is made for your motorcycle’s model. There are some basic food items that every camper and backpacker usually packs with them. The portions are small and practical. Many items do not need to be cooked and are non-perishable, meaning you don’t have to worry about packing an oversized cooler to your camper or motorcycle luggage. Obviously, if you are game to haul the cooler along with you, feel free. It will expand the availability of items greatly. Just remember that perishable items have a time limit. Nuts and seeds -- Think healthy trail mixes. Dehydrated food like fruit, meat jerky, and vegetables (of the aforementioned Mountain House Freeze Dried food packets).Flat and pita bread -- easier to pack than a loaf of bread but just as nutritious. You may even pack some peanut butter or jelly to make quick sandwiches. Again, many campgrounds have convenience stores with pre-made food options and hot food options that may be appetizing once in awhile. It’s best to see what will be available for you to use during your stay so that way you can plan out your meals. Opt for things like quick cooking oatmeal flavored with powdered milk and jelly for breakfast or simply use a freeze dried food packet. Lunch can be soup, bread, and maybe a packet of tuna. Since MREs (or “meal, ready to eat”) are bland, consider bring some spice mixes to help jazz up the food. Now that you know about the essential gear and have a checklist about what bring, there are some final pointers you should know. Adventures on your motorcycle are special. The memories of sitting beside a campfire beneath the stars is exhilarating. Now that you know how to choose your luggage, pack, and what to bring, your first moto-camping trip is waiting for you beyond the horizon. Go wherever your heart desires, have fun, and ride safe.